With the Port of San Francisco facing a multi-billion dollar challenge with respect to rehabilitating, renovating and re-purposing the city’s piers and over 100 acres of waterfront open space, a recently completed feasibility analysis prepared for the Port’s Waterfront Plan Land Use Subcommittee could help pave the way for a luxury hotel and tech space to inhabit the Port’s historic finger piers. While maritime offices, recreational uses and public-oriented attractions, such as museums, sit atop the list of most desirable uses for the historic piers, per the Public Trust, they’re not financially feasible according to the analysis. 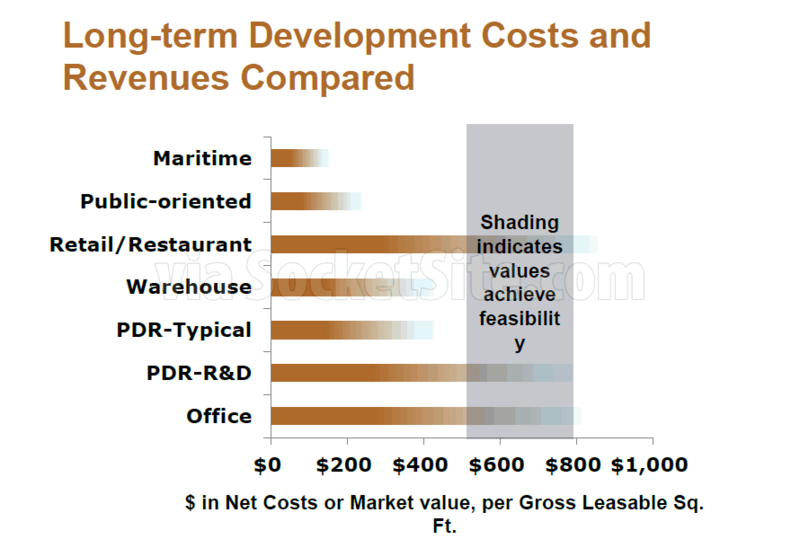 But restaurants and retail, office space, and R&D facilities could pay the bills, and then some. 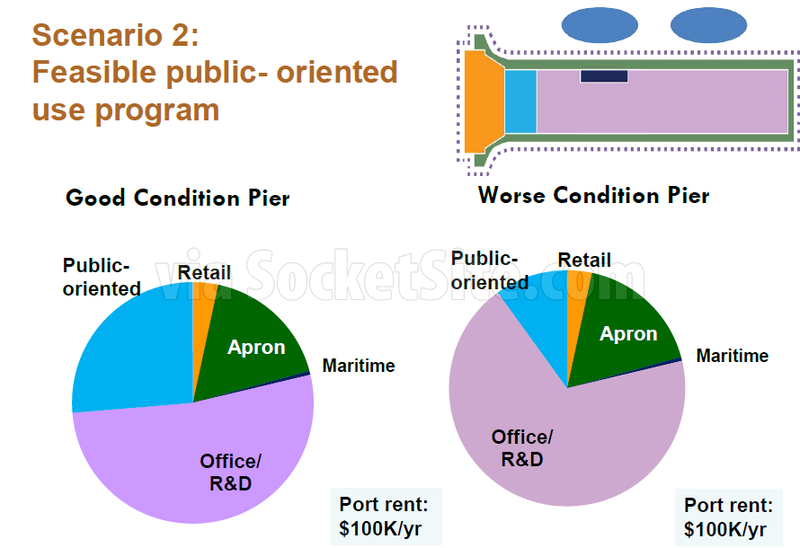 In fact, under the three scenarios modeled, while public-oriented uses would require an estimated subsidy of between $30 million and $60 million per pier; by adding an office/R&D component, a pier could net $100K per year. And by completely eliminating all public-oriented uses, a pier could generate between $350K and $2M per year. The Port’s recommendations for overhauling the City’s Waterfront Plan and shaping the future of San Francisco’s waterfront are expected to be finalized in the coming months. If it means the preservation of the piers, as opposed to letting them disappear into the bay- this seems like a sensible approach to supporting the mission of the Port. Could one or two of the piers be transformed into homeless shelters? These are large spaces in relatively central locations and the piers are unlikely to face the neighborhood opposition of new shelters. Agree! Or even unused former military or cruise ships. Telegraph Hill Dwellers hold the veto card on anything within their view. I want to think this is sarcasm. Whatever is permitted on these piers is going to have the most prime location in the city except maybe the top of the best known hills (Nob, Telegraph, Pac Heights). Plenty of companies would pay very well to be located there–money the Port needs. So you suggest a public use that brings in no cash and gives those paying nothing the best views and locations in town. This is classic San Francisco thinking I must admit. I’ve always thought that collectively the finger piers would make one fantastic neighborhood. I hope it’s sarcasm too. Right, because only rich people deserve nice things. Pier 35 and any waterfront property is prime property. It also will affect one of our money makers – tourism, and further tarnish our chronic homeless issue. It also costs an absurd amount of money to retrofit these piers – there is no way the “homeless” will power in this city is going to donate tens of millions to fix a pier. The homeless can go elsewhere. The best use of this land is for market rate property of some sort. Actually, the exact opposite will happen…this will become yet another draw for the homeless looking to panhandle along the Embarcadero. Who pays for it? There’s not really any kind of profit incentive (required to rehab and upkeep the piers) that would even support the idea. Also didn’t the city try that in Bay View already? These piers have the potential to be *spectacular* startup / office spaces, as long as you’re into open floor plans. Reminds me a bit of the former railroad station in Paris that’s being converted into one giant coworking space. 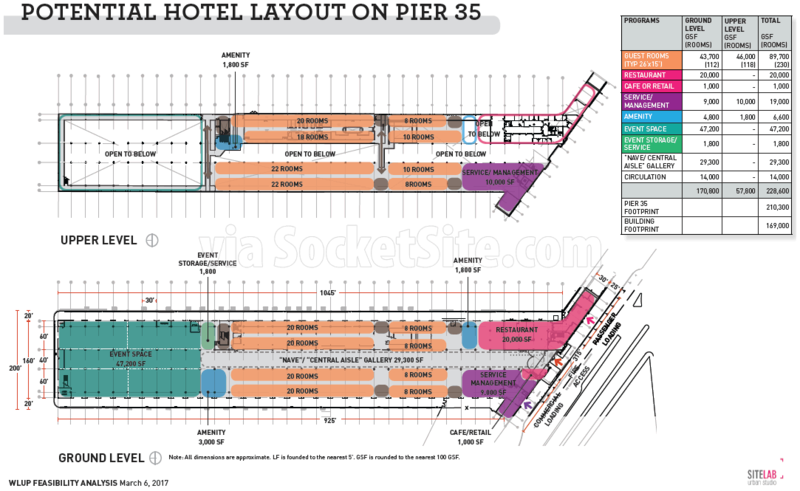 What could be more natural than for the current Pier 35 to be converted to a hotel? The port of San Francisco is not facing some awful financial crisis. It rakes in money. The problem is that this city government has such an insatiable appetite for squandering the billions that flow through its tawdry little corridors of chicanery and skulduggery that it would gladly and quite literally sell the land that Golden Gate Park sits on, for “tech space and a luxury hotel” if they thought they could get away with it. Absolutely no notion of anything except monetize monetize monetize. what planet do you live on? The Port doesn’t rake in nearly enough money to take care of its crumbling infrastructure. 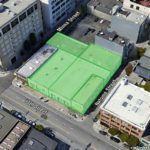 The economic use of their space is restrained by both the Public Trust and by the even more severe constraints of SF voters. And there is next to no market for “maritime uses”. Many of these piers are simply going to fall into the sea if nothing is done. A mix of public and private uses is the only thing that will save them in the long term. It doesn’t help that they leave some of their properties empty for decades while they decide what to do with them. Bob, it’s not like the Port can just decide something is OK to build. Probably a half dozen agencies/entities are involved. BDBC, Army Corps of Engineers, State Lands, etc. Plus probably a change in zoning and/or voter referendum. Part of what killed the Warriors arena on piers 30-32 is that the Federal govt said they needed approximately 5 years to review the plans…and there was no guarantee the project would be approved. The Warriors decided to go for a slam dunk (ha) instead and built in mission bay. Yeah, curmudgeon is right. Between fixing the crumble and mitigating the hazmat, the Port has to sellout to $$$ bidders (or better $$$$$ bidders), which generally maximizes density with marginal public floodzones (parks) like the Pier 70 project. The last thing we would want to do is demolish these piers and open up the view for the commoners. Look at the disasters that are Rincon Park and Brannan St Woof. Not to mention the tragic conversion of a functioning airfield into the Marina Green homeless camp. No wonder we have transportation problems. My personal fantasy for one of these waterborne sheds (fingerpiers) located between Pier 39 and the Exporatorium is a giant greenhouse, combining something like the Conservatory of Flowers, the Flower Market, and an allergy clinic. That and rebuilding the Lurline pier and restoring the Lurline Baths. Re-make SF great again. yeah more public baths ! We need a new Lurline / Sutro style public resort, and this would be a fab spot for it. I actually don’t object to having some of them fall into the sea and open up views, for the record. 😉 But I wish it were more of a choice and less of a foregone conclusion. The Port is truly in a hard place when it comes to managing their real estate. to expedite a solution, SFPortly needs to Federalize the problem. Do something that puts the need to fixate these piers on the radar of someone with the means and the will to win. Why not update googlemaps to show Piers 30-32 as the HQ for the Institute for Science In Society (ISIS), and a few of the lingering fingersheds as flourishing Marijuana sanctuaries, stir-up the anti-social graph, then wait for the inevitable surgical exercise of national cruise muscle, et viola. Got a pier with a problem, get rid of the pier, get rid of the problem. Else, time and tides and biome …. Demolish the worst piers. Seriously. SF pretends to be environmental. The old piers are an un-environmental blight on the bay. We already have enough luxury hotels and tech space. Yeah, that’s why rooms at 3-star hotels are $450 a night during big Moscone events. Do we really have enough? Seems to be in pretty high demand at the moment. I’d rather see—albeit, limited—public / commercial use of the piers and waterfront than have it be some deserted stretch of parking lots and warehouses. Demolishing piers is pretty pricey with no revenue against it. 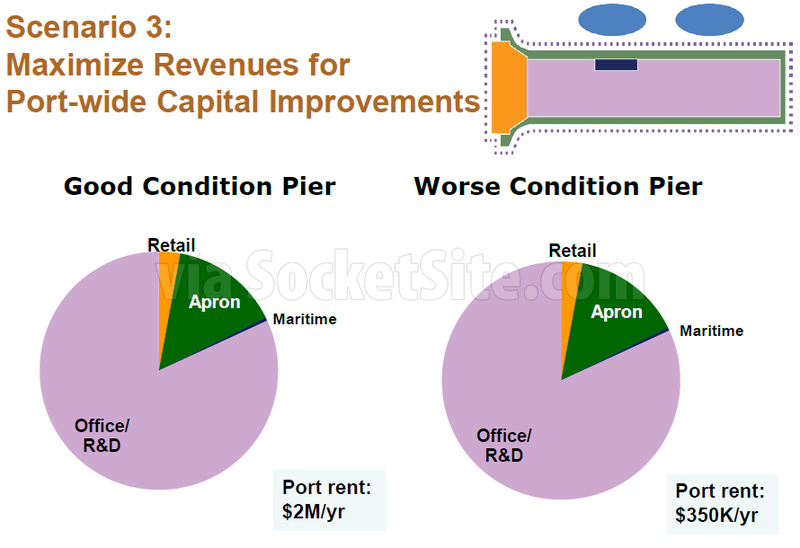 Given that we probably have to replace or patch up the sea wall the port is pretty short on funds as it is. Brooder, a portion of the piers (e.g. 30-32) will have to be demolished anyway (and re-built) if there were to be any development on top of them. Many piers are 80-90 years old and not structurally sound. The Army Corps of Engineers had to demolish pier 36 because it was unsound. The port [has] a $2 billion maintenance backlog and basically no meaningful budget. When the Hell are we going to repurpose all the fantastic acreage along the Embarcadero currently shamefully being used to park cars? Disgusting blight! 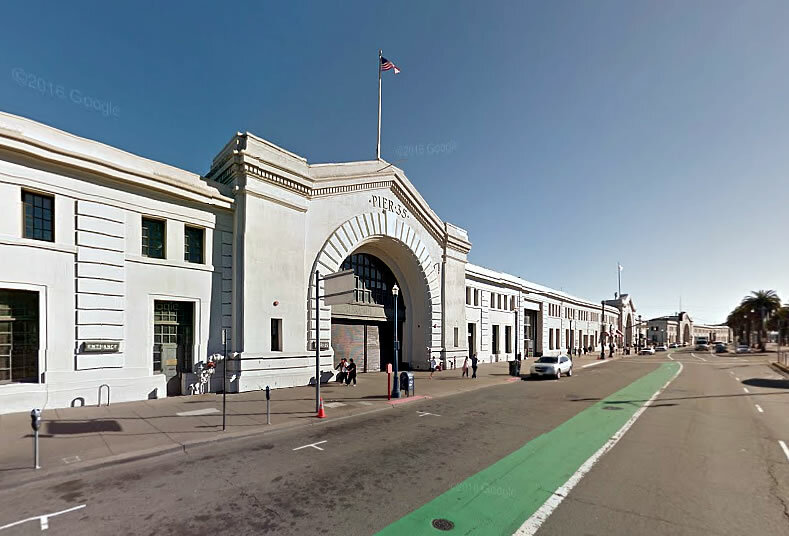 Repurpose these piers and the Embarcadero all you want, but that will only encourage more driving and the need for more parking. The F/E lines are a joke if you think they can be used as real transit. The Embarcadero is bumper to bumper traffic as it is between the Ferry Building and the ballpark. Good luck. The answer to excessive traffic (unnecessary trips) is certainly not to make it more convenient to drive but to do things which dissuade it. In any event, the current awful misuse of that property goes way beyond anything so mundane as traffic. Posh! Let’s bring back the Freeway. Anything to avoid inconveniencing the Autosexuals! Or maybe they can put it towards satisfying citizens’ legitimate demands for first-world quality transit, street sanitation or schools. 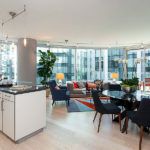 Some of the people living in and paying taxes on “unaffordable” housing might like to get some value for their money now and again. Why can’t they take, half? 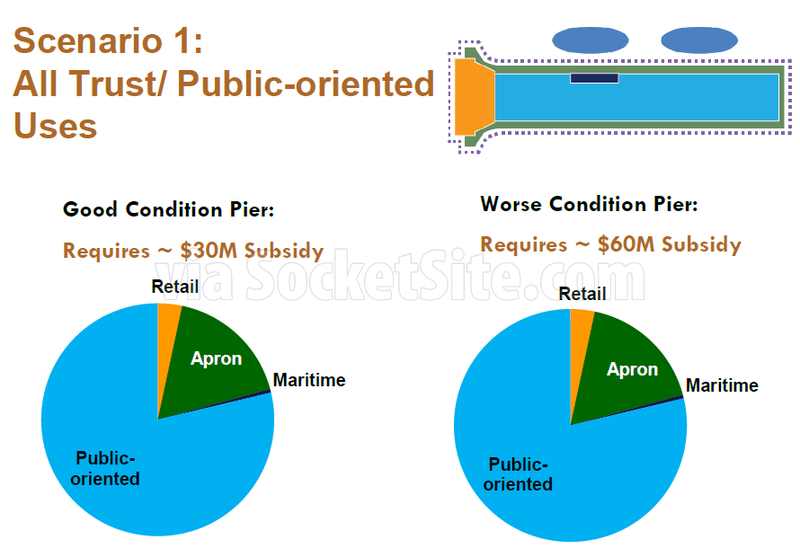 the piers – used for revenue, and use them to subsidize the other half for public purposes? Maybe the northern waterfront vs the southern waterfront? Renovating dilapidated crap along the waterfront, creating jobs and generating revenue for the city are not public purposes? The city is not a museum. Do they mention anything about “current scientific projections call for average high tides within San Francisco Bay to rise by as much as 66 inches between now and 2100.”? And the tech part may be a challenge too, given that startup creation is now down 46% since the 2015 peak. And over the past 9 months, a total of 6,777 Silicon Valley employees have been laid off, freeing up over 1 MSF of office space. 6,777 out of how many total employees? And how many have been hired during that period? You’re cherrypicking here. Of course I am, everyone knows I like to present the bear case, but there’s an easy solution, you tell me how many have been hired! Is any of the money to be generated by this expected to go toward the $5B the port says it needs to retrofit the seawall for earthquakes and climate change? It’s a shame the Warrior’s Arena wasn’t built on the waterfront but even their deep pockets couldn’t afford the expense of making the piers structurally sound. That was definitely not the problem. Political opposition and regulatory hurdles were just too daunting and would have taken too long to overcome if possible at all. SF has no money in this boom time because Ed “I’m only a stand-in, I promise” Lee kicked the pensions can down the road. Does everyone understand that fact? no, the pensions for city employees should immediately start being cut. they are so egregious. You want to talk about reforming compensation, let’s start with every CEO in the country. How is that in any way relevant? Of what relevance to issues related to the Port, topic of this thread, are SF public employees’ pensions? CEO pay is as market biased as union wages or city pensions. Last I checked very few companies, public or private, are tying down their compensation committees with huge percentages of peons. That is such a naive statement that it is kind of adorable. How so exactly? Salaries need to be approved by Boards. Funds can choose not to invest in certain equities if there is anything about the investment that is undesirable or it the company does not hold up well to competitors. In general, no company wants to have way higher SG&A than it needs to. Bloated CEO pay is a pact with the major shareholders to run the company in a way that maximizes short term profit to said shareholders at the expense of all other business considerations. Precisely. And CEO pay is set by board members who typically are present, former, or future CEOs of other companies themselves. And “validated” through the use of “consultants” who are effectively paid to validate the highest CEO pay possible. this is called a market. what is your definition of a market? yup, a market of a kind. Evidently, spencer, you have a very liberal definition of “market”, a definition that takes a wide enough stance to include the notoriously skewed bid-ask-askmore-getin-then-steal-the-store of corporate America. Surely, then, by your generous allowance, there are also markets for civil and secular service, even with their pension plans. For example, both the City of SF and the Archdiocese of SF recently hired new supers of schools. Market searched, board approved, etc. Marketplace tranzactors, one and all. Oh, and if you wanna see “huge pensions” and many creative forms of gold weighted benefits (parachutes, handcuffs, etc), then check out the employment contracts of CEOwes. i would say my definition of a market is pretty standard. I do realize that CEO parachutes are outrageous, but govts are giving outrageous parachutes to rank and file and the citizens pay for that on our dime. I personally dont care if the apple CEO makes $1B/yr, but i do care where my taxpayer money goes. our services are being bartered for inflated pensions. I never said it was an efficient market btw. Too bad, San Francisco couldn’t do what the city of Bordeaux, France did. It’s all about profit and most money for the bang, rather than what’s best for the residents of SF. In related news, Port Soliciting Concepts for Thirteen of San Francisco’s Historic Piers.